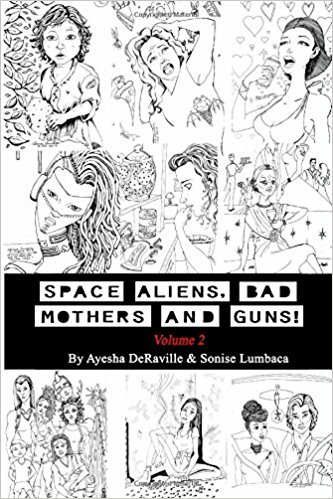 In this episode we talk with the Ayesha DeRaville and her twin sister and collaborator Sonise Lumbaca about their most recent re-collaboration, Space Aliens, Bad Mothers and Guns: Volume 2. 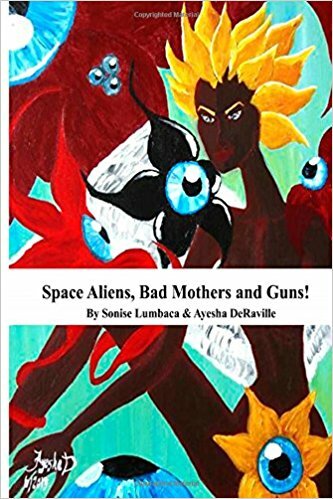 These sisters are articulate, intelligent talented writers and artists an have come up with a refreshing twist on the idea of a novel. In fact, SABM&G vol. 1 and 2 are not really novels at all but instead a series of not necessarily connected short stories interspersed with fantastical artwork. What’s even more intriguing is that when asked which one writes and which one creates the artwork, the answer is … yes. 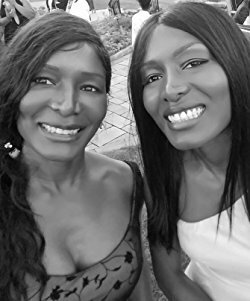 Both women have very specific and expressive writing styles and artistic styles, so the “novel” becomes instead a pastiche of diverse concepts and styles and keeps the reader both intrigued and riveted. As for any sense of continuity between the volumes, again, yes and no. One story in volume 2, Adipose, is a continuation of the story themeology of The Enemy in volume 1, although both are competent stand alone reads. In a time when the long form novel is the standard, these imaginative ladies have altered the presentation in such a way as to entice the reader into their pocket universe and it’s a fun ride. As an interesting side note, during the interview we all had an argument as to whether Iceland is in Europe or Scandinavia. This factoid is important because the sisters have been invited to the Midgard Convention in Reykjavik, Iceland. In order to help defray the expense they have set up a gofundme page. If you’re interested in helping them out there are some pretty nice reward tiers. Great thanks to Ayesha and Sonise for a wonderful time. Enjoy the chaos.